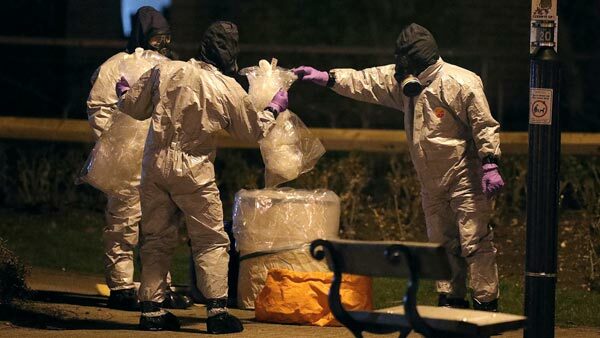 MOSCOW -- Russia on Thursday responded quid pro quo to the wave of Western expulsions of Russian diplomats over the poisoning of an ex-spy and his daughter in Britain, while a hospital treating the pair said the woman is improving rapidly and is out of critical condition. Two dozen countries, including the U.S., many EU nations, and NATO, have ordered more than 150 Russian diplomats out this week in a show of solidarity with Britain - a massive action unseen even at the height of the Cold War. Lavrov added that just as he was making the statement, U.S. Ambassador Jon Huntsman was invited to the Foreign Ministry, where he was handed notice that Russia is responding quid pro quo to the U.S. decision to order 60 Russian diplomats out. The Foreign Ministry said the U.S. diplomats, including 58 diplomats from the U.S. Embassy in Moscow and two from the U.S. consulate in Yekaterinburg, must leave Russia by April 5. It added that the U.S. must leave the consulate in St. Petersburg no later than Saturday. The ministry warned that in case the U.S. takes further "hostile actions" against Russian missions, Russia will respond in kind. "We invite the U.S. authorities who are encouraging a slanderous campaign against our country to come back to their senses and stop thoughtless actions to destroy bilateral relations," it said. Lavrov emphasized that the expulsions followed a "brutal pressure" from the U.S. and Britain who forced their allies to "follow the anti-Russian course." He also noted that the job of the international chemical weapons watchdog is to determine what chemical agent was used to poison Skripal and his daughter, not verify the British conclusions. Lavrov said that Moscow called a meeting Monday of the secretariat of the Organization for the Prohibition of Chemical Weapons to discuss the case. Meanwhile, Salisbury NHS Trust, which oversees the hospital where the Skripals are being treated, said Thursday 33-year-old Yulia is "improving rapidly and is no longer in a critical condition. Her condition is now stable." "She has responded well to treatment but continues to receive expert clinical care 24 hours a day," said Dr. Christine Blanshard, medical director at Salisbury District Hospital. Lavrov said that Russia would seek consular access to Yulia Skripalr now that she regained consciousness. Britain says he and his daughter, who was visiting from Russia, were poisoned with a nerve agent developed in Soviet times and that it must have come from Russia. Police say they were likely exposed to the poison on the door of Sergei Skripal's suburban house in Salisbury, where the highest concentration of the chemical has been found. About 250 British counterterrorism officers are working on the investigation, retracing the Skripals' movements to uncover how the poison was delivered. They have searched a pub, a restaurant, and a cemetery, and on Thursday cordoned off a children's playground near the Skripal home. Russian Foreign Ministry spokeswoman Maria Zakharova said Thursday that Britain's allegation of Russian involvement in the poisoning was a "swindle" and an "international provocation." She said Russia continued to demand access to investigation materials, which Britain has refused to share. Zakharova charged that Britain, the U.S., the Czech Republic and Sweden all have researched the nerve agent that London said was used to poison the Skripals. She said that the Western research into the class of nerve agent, known as Novichok, was reflected in numerous open source documents of NATO members. Britain and its allies have dismissed previous Russian claims that they possessed that type of nerve agent.